This week's top time capsule stories from around the world include an abundance of riches in Florida, a surprise capsule found by some rather patient people Down Under, and the old question of tech obsolescence at a school in California. 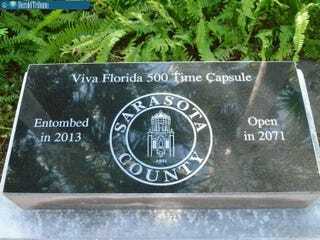 Sarasota County, Florida recently asked its residents to contribute items for a new time capsule. And believe it or not, the county had to buy a second capsule just to handle all the stuff that was donated!